← The Staff of Odin: Where Are They Now? To try to answer that question, I found myself looking at something else that I happen to be a huge fan of. As most people are aware of by now, American football season is upon us. For me, that means checking up on player stats, browsing the injury reports, hounding the latest highlights and previews, and of course, spending three hours on game day watching our punter shine. One of my favorite football personalities is Paul Allen, radio play-by-play announcer for the Minnesota Vikings. Here are some of his calls. The man has the uncanny ability to lace his words with power and urgency. Often times, I feel as if I’m not only listening to the game, but actually part of the game itself. I guess if there was anybody I wanted to imitate when starting this whole anime blogging deal, P.A. was the guy. Someone who spoke of the seemingly ordinary in an extraordinary manner. Of course, on the national level, people are more likely to know the big names. You have the game-time commentators such as Cris Collinsworth, Al Michaels, or the retired John Madden who provide us with real-time play-by-play. You have your big name analysts and network personalities. These include the guys who run Fox NFL Sunday, whom we tune into before and after the game to receive their opinions, insights, and overall thoughts. You also have your high-profile columnists such as NFL.com writers Vic Carucci and Michael Lombardi. These people break down the games, the teams, injuries, roster moves, and predictions (with rigorous detail I might add). They are the de facto source for which most of the off-shoot discussions stem from. What really strikes me as interesting is how similar the commentary and discussion revolving around American football resembles that of anime blogging. Back in 07-08 when the Michaels/Madden duo was still the voice of Sunday Night Football, I used to watch them all the time. Despite the monotony of a nationally televised game from a commentating point of view, I still enjoyed their stats, and occasional insights. It’s a pragmatic format, with the basis of commentary being formed around “summary” and “reaction,” but it works. 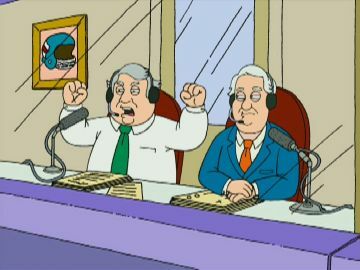 The anime blogging community has its fair share of Al Michaels and John Maddens; those who give recounts and “color commentary” for the latest football broadcasts (replace football with Japanese cartoons). The community also has its Michael Wilbons and Tony Kornheisers; the satirists and entertainers. The Terry Bradshaws and Deion Sanders; the popular personalities. And last but not least, the Vic Caruccis and Michael Lombardis; the analytically inclined, the theorists, and those who dig a little bit deeper than usual. With the way the community is shaping, I’d argue that our popular discourse resembles that of professional sports more so than that of literature, film, or academia. Whether that is a good or bad thing is up for debate. This seemingly exhaustive hierarchy exists for many reasons, but I believe a huge contributing factor lies with the fans themselves. Football and Japanese cartoons are too vastly different things, but they both have dedicated fans, many of whom don’t spend their time bickering amongst themselves on the internet. Why don’t we mute the TV if the commentary is simply rehashing what’s happening on-screen as the replay rolls? Well I’d imagine it’d be a rather dull experience. How about all these blogs that supposedly do the same thing with Japanese cartoons and screen-caps? I won’t try to legitimize this post by implying there exists some point we should all take away from it. There isn’t any. Only random observations that flow in and out of my stream of consciousness as I wait for my Vikes to lock up Adrian Peterson. In the end, I still don’t know why I have created this abomination of various unicorns. But I also don’t think these unicorns are without merit either. We do what we do because the format works, to a degree. Certain detractors may say otherwise, but what they’re really doing is ruining a perfectly good game of FOOTBALL! This entry was posted in Meta and tagged John Madden. Bookmark the permalink. 2 Responses to That Guy’s Ruining a Perfectly Good Game of FOOTBALL! Good observation of the commonalities between the two fandoms. I’d argue the similarities in variation of community coverage is rooted in the cyclical week-to-week way both football and recent anime is consumed by its fans. Each week brings new games or episodes, where fans form an emotional investment in the ups and down of players and teams, or characters and shows. So there’s ample opportunity for reactions, tastemakers, predictors, and analytics of all kinds to surround the same series of events. If you examine how “anime blogging” went 10 years ago, it was much more static, with much greater percentage being whole series reviews, fan shrines, and scholastic essays, much like literature and film communities. The anime crowd back then simply didn’t have the means to follow shows as they air. The present time and technology has made anime such enormously available that there’s enough material to feed all the noise that surrounds it, and each new week begins the cycle all over again.